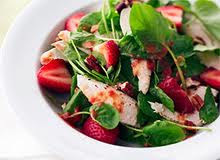 In a large bowl, combine the chicken, celery, spinach and onion. In a small bowl, combine the yogurt, chutney, lime juice, lime peel, curry and salt. Add to chicken mixture and toss to coat. Cover and refrigerate for at least 1 hour. Just before serving, stir in berries and top with nuts.